A key player in 20th century art, French painter and sculptor Georges Braque (1882 - 1963) largely influenced and developed the Cubism art style. Early on, Braque’s style of art was impressionistic; however, he soon adopted a Fauvist style after experiencing the work of The Fauves. The term “Fauves,” or Beasts, included artwork by other influential artists whom we feature: Henri Matisse and Andre Derain, among others. After gaining exposure through his Fauvist works, Georges Braque’s artwork soon took on a more geometrical style. Much of the Georges Braque art after 1909 involved paintings reducing a structure to a cubist, geometrical form; this allowed the Georges Braque Cubism paintings to look both planar and 3D at the same time. Similarly incorporating this cubist style of painting at the time was Pablo Picasso, with whom Braque began to work closely. This is one of many reasons Georges Braque's art is considered to be synonymous with the Cubist movement. Medium: lithograph (after the watercolor sketch). 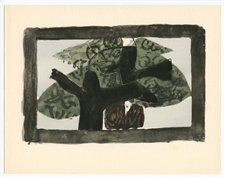 One of the beautiful compositions from George Braque's Intimate Sketchbooks (Carnets Intimes). Braque had kept these drawings private, but finally consented to having them published -- by Teriade for the deluxe art revue Verve (No. 31-32) in 1955. The lithography was done under the artist's supervision and printed by Mourlot Freres. The total sheet measures 14 x 10 1/4 inches (355 x 260mm). Not signed. Medium: original lithograph. Printed for the front cover of Derriere le Miroir (issue no. 135-136) in 1963 and published in Paris by Maeght. Sheet size: 15 x 11 inches (380 x 280 mm). Not signed. Medium: lithograph (after the watercolor sketch). One of the beautiful compositions from George Braque's Intimate Sketchbooks (Carnets Intimes). Braque had kept these drawings private, but finally consented to having them published -- by Teriade for the deluxe art revue Verve (No. 31-32) in 1955. The lithography was done under the artist's supervision and printed by Mourlot Freres. The total sheet measures 13 5/8 x 10 1/4 inches (345 x 260 mm). Not signed. Condition: the top margin has been trimmed slightly, not affecting the image. Medium: lithograph (after the gouache). Printed for Derriere le Miroir (issue number 144-145-146) in 1964, and published in Paris by the Maeght atelier. The total sheet measures 15 x 11 inches and the image measures 11 x 6 inches. There is text on verso, as issued. Signed in the plate, not hand-signed. Medium: lithograph (after the watercolor sketch). One of the beautiful compositions from George Braque's Intimate Sketchbooks (Carnets Intimes). 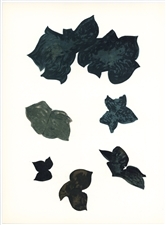 Braque had kept these drawings private, but finally consented to having them published -- by Teriade for the deluxe art revue Verve (No. 31-32) in 1955. The lithography was done under the artist's supervision and printed by Mourlot Freres. The total sheet measures 14 x 10 inches (355 x 255 mm). Signed in the stone (not by hand). Condition: there is a minor age-toning to the paper and a bump to one corner. Medium: lithograph (after the painting). Published in Paris by Maeght for Derriere le Miroir (issue No. 115) in 1959. The image measures 9 x 3 3/4 inches (230 x 93mm); the total sheet size is 15 x 11 inches (380 x 280mm); there is printed text on the back side, as issued. Signed with the Georges Braque monogram signature in the stone (not by hand). A nice impression! Condition: there are a few spots of foxing in the margins, not affecting the image. Medium: lithograph (after the painting). Published in Paris by Maeght for Derriere le Miroir (issue No. 115) in 1959. The image measures 9 x 2 3/4 inches (230 x 70mm); the total sheet size is 15 x 11 inches (380 x 280mm); there is printed text on the back side, as issued. Signed with the Georges Braque monogram signature in the stone (not by hand). A nice impression! 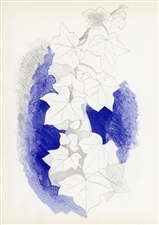 Medium: lithograph (after the watercolor sketch). One of the beautiful compositions from George Braque's Intimate Sketchbooks (Carnets Intimes). Braque had kept these drawings private, but finally consented to having them published -- by Teriade for the deluxe art revue Verve (No. 31-32) in 1955. The lithography was done under the artist's supervision and printed by Mourlot Freres. The total sheet measures 13 3/4 x 10 1/4 inches (350 x 260 mm). Not signed. Medium: lithograph (after the watercolor sketch). One of the beautiful compositions from George Braque's Intimate Sketchbooks (Carnets Intimes). Braque had kept these drawings private, but finally consented to having them published -- by Teriade for the deluxe art revue Verve (No. 31-32) in 1955. The lithography was done under the artist's supervision and printed by Mourlot Freres. The total sheet measures 14 x 10 1/4 inches (353 x 260mm). Not signed. Medium: lithograph (after the gouache). 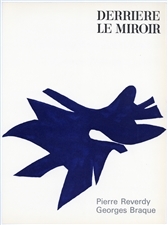 Printed in Paris by Maeght for Derriere le Miroir in 1967 (issue No. 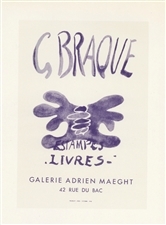 166 -- Georges Braque Derniers Messages). Total sheet size: 15 x 22 inches (380 x 560 mm). There is printed text on verso with a center fold, as published. Not signed. Condition: there are minor stains in the margin at the bottom corners of the sheet (not affecting the image). Georges Braque lithograph "La Chaise"
Medium: lithograph (after the painting). Printed for Derriere le Miroir (issue no. 135-136) in 1963, and published in Paris by Maeght. Sheet size: 14 3/4 x 10 3/4 inches (380 x 273 mm). There is text on verso, as published. Signed in the plate, not by hand. Medium: pochoir (after the oil). Published in Paris in 1929 by Charles Moreau in a limited edition for L'Art Cubiste. This is a magnificent and rich impression printed by pochoir master Daniel Jacomet; it is presumed that no more than 1000 impressions were printed and this edition is now rare. Image size: 7 1/2 x 6 inches (195 x 150 mm); the artist's name is printed in text beneath the image. Not signed. Medium: original lithograph. The catalogue reference is Vallier 150. Executed for the "Poetes, Peintres, Sculpteurs" issue of Derriere le Miroir (No. 119) in 1960. Sheet size: 15 x 22 inches (380 x 558mm). This lithograph was issued with a center fold and printed text on the back side. Not signed. Condition: there is minor wear to the edges of the sheet. Medium: lithograph (after the original lithograph for ). Printed for Derriere le Miroir (issue no. 135-136) in 1963 and published in Paris by Maeght. Sheet size: 14 7/8 x 10 7/8 inches (380 x 277 mm). There is text on verso, as published. Not signed. 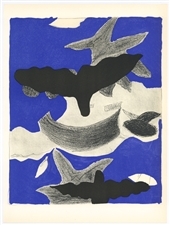 Georges Braque lithograph "La Liberte des Mers"
Medium: lithograph (after the original lithograph for La Liberte des Mers). Printed for Derriere le Miroir (issue no. 121-122) in 1960, and published in Paris by the Maeght atelier. Sheet size: 15 x 11 inches (378 x 278 mm). There is text on the back side, as issued. Not signed. Medium: lithograph (after the gouache). 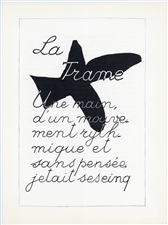 Published in Paris by Maeght especially for the front cover of Derriere le Miroir in 1967 (issue No. 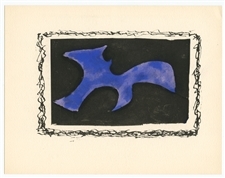 166 -- Georges Braque Derniers Messages). Total sheet size: 15 x 11 inches (380 x 278 mm). Not signed. Medium: lithograph (after the oil on paper). Printed for Derriere le Miroir (No. 144-145-146) in 1964, and published in Paris by the incomparable Maeght atelier. The total sheet measures 15 x 22 inches and the image measures 6 x 19 3/4 inches. There is a center fold and text on verso, as issued. Signed in the plate, not by hand. Condition: there is minor soiling and some handling creases. Medium: lithograph (after the painting). Published in Paris by Maeght for the back cover of Derriere le Miroir (issue No. 115) in 1959. The image measures 8 x 7 inches and the full sheet size is 15 x 11 inches. There is printed text on the back, as published. Not signed. Condition: there is foxing in the margins (see the second photo). Medium: lithograph (after the watercolor sketch). One of the beautiful compositions from George Braque's Intimate Sketchbooks (Carnets Intimes). Braque had kept these drawings private, but finally consented to having them published -- by Teriade for the deluxe art revue Verve (No. 31-32) in 1955. The lithography was done under the artist's supervision and printed by Mourlot Freres. The total sheet measures 13 3/4 x 9 3/4 inches (350 x 247 mm). Not signed. Condition: there is a minor crease in the margin near the top left corner. Condition: there is wear along the center crease. Medium: offset lithograph (after the painting). Printed for the special Homage to Braque issue of Derriere le Miroir (No. 144-145-146) in 1964, published in Paris by Maeght. The total sheet measures 15 x 22 inches; the image measures 13 x 16 1/2 inches. There is a center fold and printed text on the back side, as issued. Signed in the image, not by hand. Condition: there is creasing near the top center. 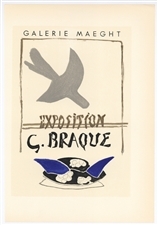 Georges Braque lithograph poster "G. Braque Exhibition"
Georges Braque lithograph poster "Estampes Livres"
Medium: lithograph (after the original lithograph poster for the Maeght Gallery). During the late 1940's and throughout the 1950's, Georges Braque created a series of posters at the atelier of Mourlot Freres. 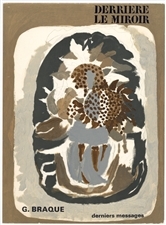 The lithograph offered here was printed by Mourlot in 1959, reproducing the Braque poster in a smaller size. The total sheet measures 12 x 9 inches (approximately 300 x 230 mm). Signed in the plate, not hand-signed. 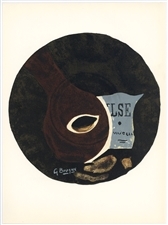 Browse our authentic and affordable selection of Georges Braque art - lithographs and pochoirs inspired by Georges Braque Cubism paintings, drawings and other original pieces.